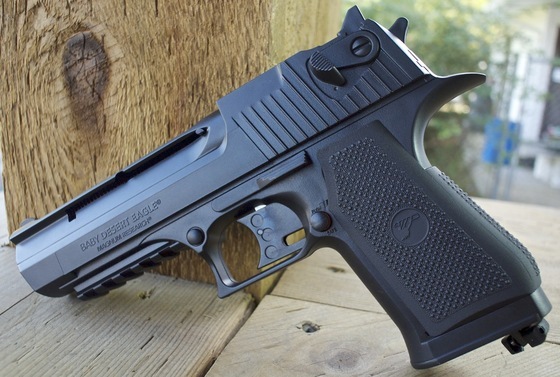 Model:Magnum Research Baby Desert Eagle. Materials: Mostly plastic with internal metal parts. Barrel: 4.25 inches, metal non-rifled. Action: Semi auto, non-blowback, double action only. Ammunition Capacity: 15 rounds - Internal spring fed magazine. Realism: This is a very close replica in terms of looks only (not to scale) to the real actual Magnum Research Desert Eagle with licensed trademarks and all. 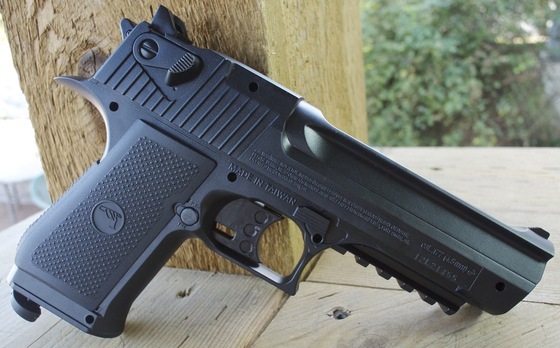 Keep in mind this is the "Baby" version so it is significantly smaller and lighter than the Pellet shooting full size Magnum Research Desert Eagle which could actually be a benefit to those with smaller hands. 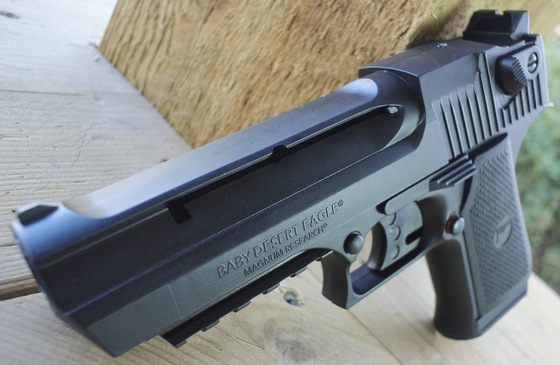 But again if we are simply talking about "looking like" a Desert Eagle than the Umarex Baby Desert Eagle does look the part, well except for the strange looking slide trigger. Price is right at around $50. Will fit smaller hands much better than the full sized Desert Eagle. Has both a top and bottom picatinny rail for all your accessory mounting needs. Not bad in terms of power, accuracy and CO2 usage combination. Very few actual working parts, only the trigger and cross bolt safety. Trigger is very long and kind of unpredictable. If you decide to mount the included top picatinny rail, you will not be able to use the pistols built in iron sights anymore. Unsightly screw holes on the left side of this air pistol. No drop out magazine of any type.